In the middle of the night I write the best posts while laying in bed and can’t possibly writing anything down and can’t remember any part of it. It makes me so sad. I had the best stuff going through my head about this and now I’m just writing this drivel. Anyway I used the app 1 Second everyday to compile this video and I’m so glad I stuck with it. I love this video and can’t wait to see next years. 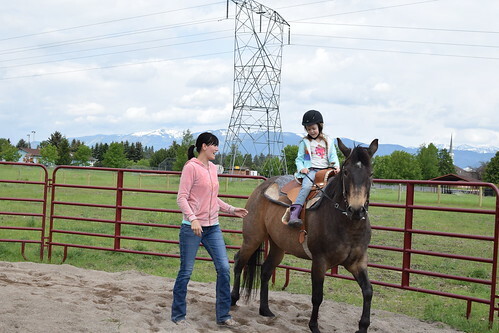 For months and months, Ok about 4 months or so Lily had been asking to ride a horse. 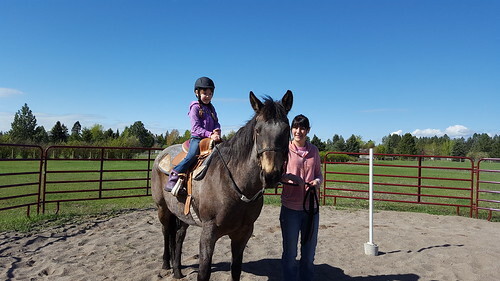 I kept putting it off for 2 reasons; 1) where do you find a horse to ride when you aren’t in the horse scene and 2) Lil’s really timid so I didn’t think she would actually ride the horse and it would be traumatic for her. 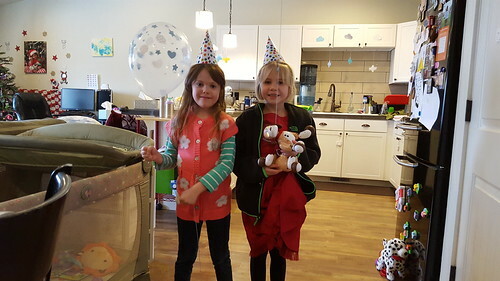 A few months ago we started doing a Special Day each month with the kids, really for now it’s just for Lil, but eventually it will be for both of them. Each month one of the parents take a child and does something special with that one, then they switch up the next month. 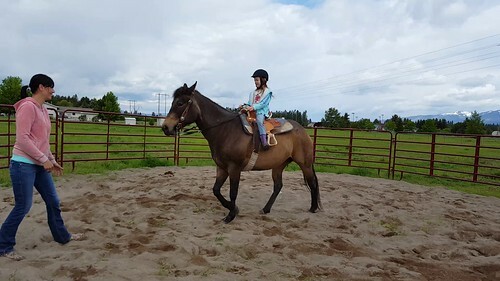 One day on one of the local Facebook homeschooling pages someone asked about where to ride a horse locally, I started following the conversation and then messaged the two people that we were told would do rides/lessons. 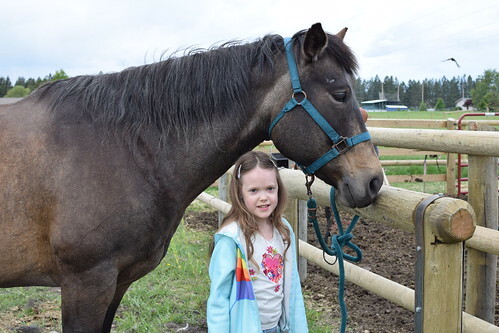 One of the ladies-Hannah and I struck up a deal and Lily’s horse riding adventure started to come together. 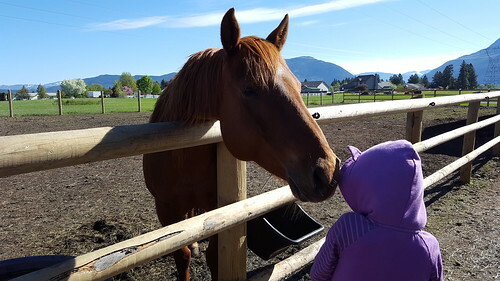 I decided that it would be a great Special Day thing to do and I also decided that if all Lil did was look at the horses it would be worth it. 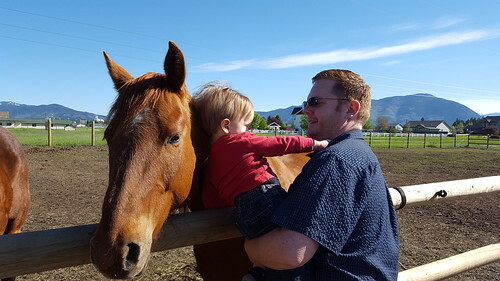 Even though we decided it would be a Special Day all 4 of us went to see the horses and it was a huge hit. 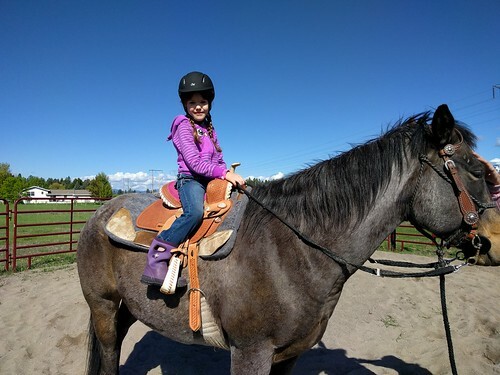 Hannah had 4 or 5 horses and one pony. All of the animals were very friendly and we all petted, snuggled and gave treats to all of them. 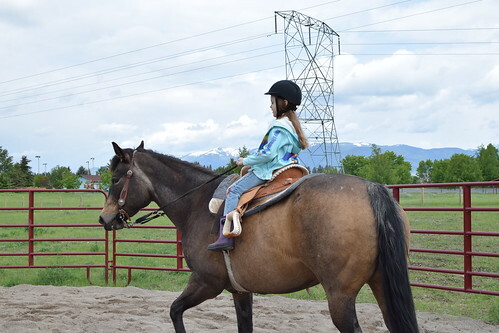 Then the big moment came and Lil got on a horse; Oakley and rode around a ring with Hannah leading. It was awesome. 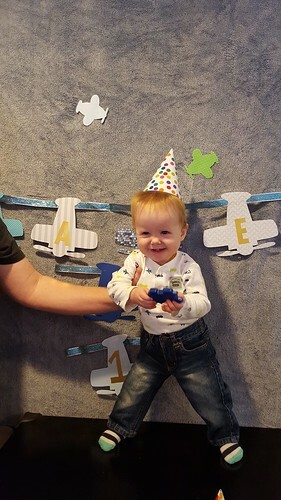 Lil had a fantastic time and wanted more. 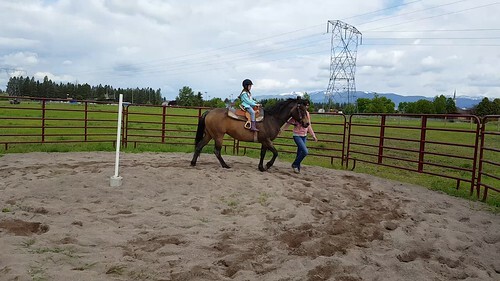 Since dance was not happening during the summer we decided to do 2 riding lessons a month during that time. 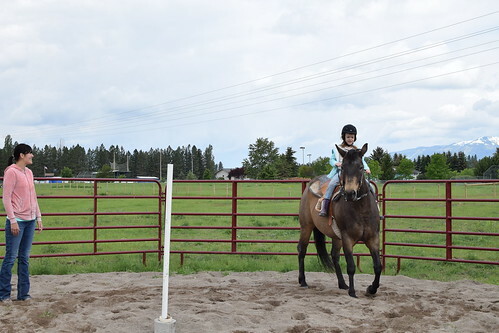 We went to her second lesson last weekend and I was so proud of Lil. 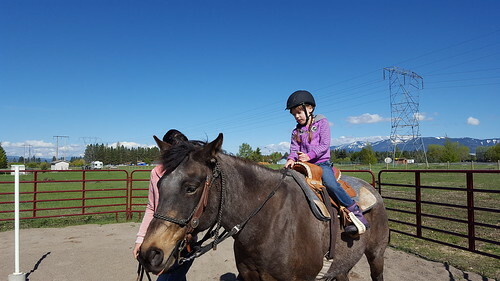 About halfway through the riding part of the lesson Hannah asked Lil if she wanted to try riding two handed, rather than using on hand on the horn and on hand on the raines, Lil gave it a try and had really no problems with it. Hannah then let go of Oakley and Let Lil control her herself and Lil did great. Oakley is trained to follow or go to Hannah so Lil had to keep fighting her, but she did great. Hannah was really impressed and so was I. My little cowgirl. 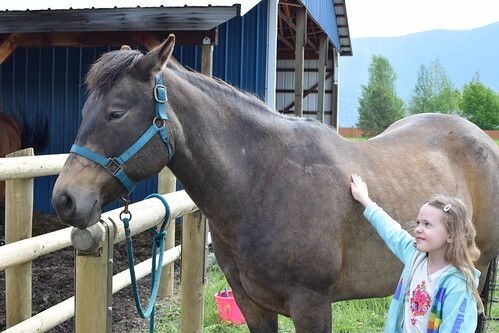 Lily meeting on of the horses (Cleo I think) for the first time. Lily’s first lesson. Getting a feel for Oakley. How meta. 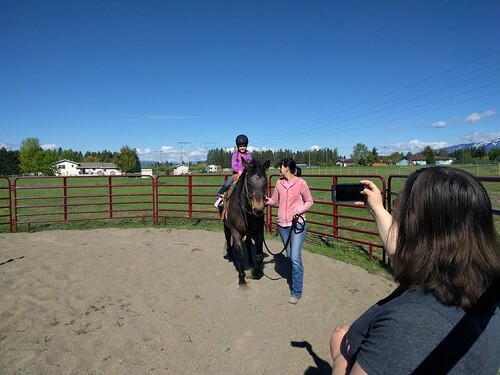 Mark took this one of me taking pictures of Lil during her first lesson. Lesson 2. Hi Oakley. She’s so much braver already. Using two hands with Hannah close. Using two hands, all by herself. I believe she’s stopping Oakley here. Because I can’t stop myself, here’s a couple videos of Lil riding. The day before Thanksgiving I told Waldo that he could sleep in Thanksgiving morning because I needed to make the rolls that we were going to take to dinner with us. However my body had other ideas. 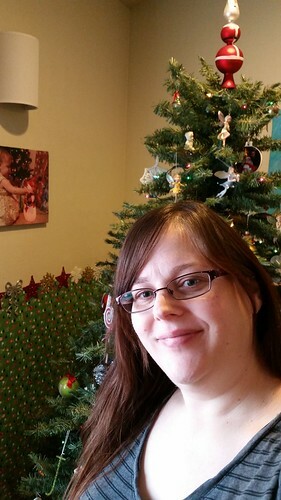 At 4 on Thanksgiving morning I woke up for one of my normal 4 or so nightly pregnancy potty trips. I woke slowly and took stock of my body to see if I really needed to get up or if I could fall asleep for a little longer. The only think I noticed was that Yes I did need to pee. As I scooted out of bed (I had to scoot or crawl to the foot of the bed because the bed is sort of next to the wall) I noticed a pain in my lower back and a…squishy squirt. Hmmm I thought, that’s not normal, I really hope I didn’t just pee. I got into the bathroom and checked the pad I thankfully had on and no in fact I hadn’t peed, either my water broke or I lost my mucus plug. Either way, NOOOOOOOOOOO I’m only 37 weeks, I don’t want to have a baby today. 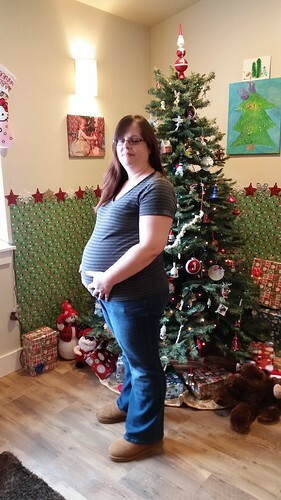 I want to go to term, I want to make rolls for Thanksgiving, I want more time to prepare, I want to feel my little man kicking me more, I want, I want, I want. But who cares what I want in this situation. I decided that I wasn’t sure what was happening so I was going to go back to bed and see what happened when I woke up in the morning. I was pretty sure it wasn’t my water, but thought it might be the mucus plug and I knew you could loose that and still go for weeks before the baby was born. I wasn’t having contractions so I figured maybe, just maybe I wasn’t in labor. I laid back down and almost immediately I had lower back pain much like period pain. Great! Mark was still asleep so I decided sine I wasn’t certain what was going on there was no reason to bother him so I tried to go back to sleep. Of course those occasional very much like period cramps that were now showing up in the front weren’t helping. A bit later Mark got up to go to the bathroom and I gave up on sleeping. Too much was going through my head so I grabbed my phone and googled mucus plugs. When Mark came out and saw the light from my phone he inquired what I was doing so I told him. His response was even more of a strong NOOOOOOOOOOOOOOOOOOOOOOOOOOOOOOOOOOOOOOOOOOOOOOOOOOOO than mine. He told me to go back to sleep. He did go back to sleep, but no matter how hard I tried I couldn’t. Too many thoughts running around my brain; what I needed to get done, what I wanted to get done, what I wished I hadn’t procrastinated on, making rolls for Thanksgiving sounded so fun, ouch damn these cramps aren’t going away and don’t feel good. So I eventually gave up and downloaded a contraction timer and the real fun started. I swear to you I really did think I was kidding myself with the timer. I mean the cramps weren’t that bad and they weren’t that regular and I’m 3 1/2 weeks early, no way both of my kids would be born early. I laid there from 5:21 until 6:30ish timing these not-contractions. 9 minutes apart, 16 minutes, 14, 17, 10, 12 and then I got up because really sleep isn’t happening and Lily came in so might as well let Mark sleep. And darn it I have rolls to make. I didn’t say anything to Lil as I continued to time these fun couldn’t-be-contractions. 11, 1 oh no, 11 oh good, 21, 10, 27, 1 crap, 2, crap, 4, ohhh, 2, 1 this is getting serious, 11 ok, I can eat breakfast now, 12, 9. So I decided to wait on the rolls not at all because I had at this point started needing to hold on to the counter and sway my hips during the couldn’t be contractions, no I waited on the rolls because my Kitchen aid might wake Mark up. Making scrambled eggs and toast for the two of us wasn’t easy and I wasn’t really hungry, but I did it. 8, 13, 28, 15 see these aren’t real, 5, 6. Mark woke up and after talking and telling him about my couldn’t be contractions we decided I should call the hospital to see what they say. They fricking said to call my doctor’s office. I had just been to a what to expect during labor class at said hospital and they said to call the hospital. I was annoyed. I called the office, since it was Thanksgiving they had to put a call into the on-call. I waited for the call holding on to whatever I could find and swaying my hips. 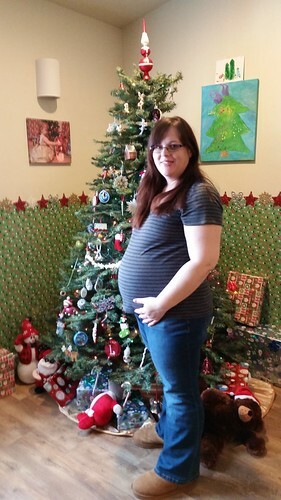 The doctor called back and after my explanation she said I needed to go to the hospital in the next few hours to get checked because it sounded like my water broke, but since I wasn’t sure I was having real contractions or not I didn’t have to rush. I said that was good because I didn’t have a bag packed for Lil and it would take a couple of hours to get there. And so this started the worlds slowest rush to pack. 5, 4, 2, 4, 2 oh this is getting real, 3, 5, 3. 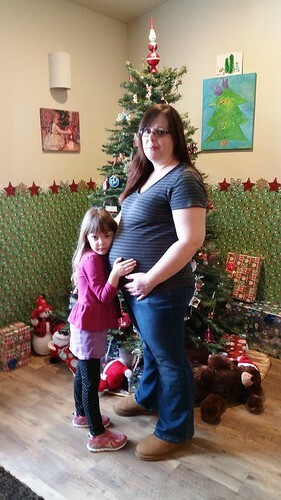 I had hopped to labor at home as much as possible, but because I was a VBAC they wanted me there fairly early. These could-likely-really-be-contractions were starting to get really painful, but I have a high pain tolerance so I was still doing mostly ok. 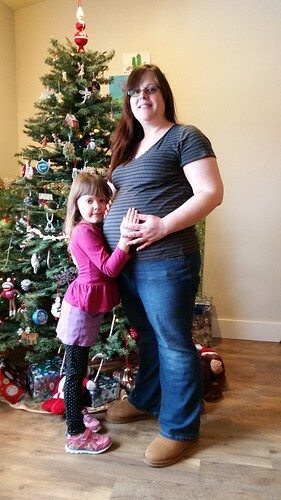 I packed, instructed, dressed, texted all the while timing ok-I-give-they-are-contractions and swaying my hips. 2, 2, 2, and now they were starting to last longer than the 20-45 seconds of the good ole days, now it was more like 45 to over a minute. At one point I told Mark that it was like my body remembered the pitocine from Lily and recreated those hard on-top of each other contractions. 2, 2, 1, 2, 3, 3 I think you get the idea. At one point I also told him that it felt like my uterus was being ripped open by the hands of hell. Yeah, it was fun. Finally we were packed, but no way were we leaving without some pictures. I might be in hard labor, but I’m still me. Having a contraction, this isn’t fun. Once I was done torturing myself and everyone else we headed out. 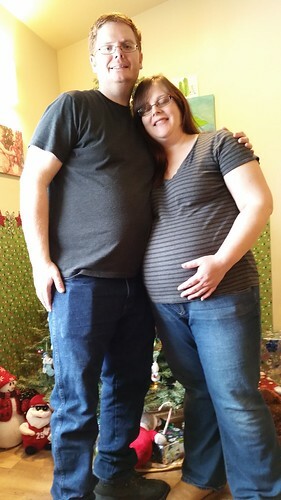 Originally we were going to take Lil with us to the hospital and then if I was in true labor Mark was going to take Lil to our friends house. However he figured it would be better to take her first so he wouldn’t have to leave me and it turned out to be a very good idea. Wherever I read that the car ride to the hospital was the worst thing ever was so right. You feel every single little bump and having contraction while confined to the car seat and seatbelt nearly had me coming undone. Luckily we live in a pretty small town so it wasn’t tooooo far from our house to our friends and then to the hospital, but let me tell you something. When you are having contraction every 2 minutes we might as well have been driving to New York or something. It was killing me. Finally we get to the hospital and the last contraction I timed was at 12:29 pm. I had pre-registered which was brilliant. We got to the nurse station inside the labor & delivery department and told them that I needed to be checked because I was probably in labor. Cue more hip swinging and deep breathing. The lovely young nurse waits patiently for me to finish swaying and be able walk again and takes us to a labor room. She helps me get changed and then tells me to get in bed so they can monitor me. This is where I shouldn’t have been such a good girl. That bed was so much worse than the car ride. Ugg laboring on your back should be classified as some kind of crazy torture and I knew this, but I’m a good girl. So I got in bed and they hooked me up. She was in and our for about a half hour and then they determined that my water did indeed break. She tells me she’s going to check me and I look over at Poor Mark who has no idea how to help and he hates it and I tell him “If I’m only 2 cm I’m going to scream” She tells me I’m 7 and +2. Thank goodness, no one has to die. She had to call my OB to come down since I was a VBAC and told me I could get up soooooon. I don’t remember why I needed to continue to be tortured, but I’m sure she had a reason. I felt like a caged animal when the contractions hit and they were right on top of each other. Fast forward a little while and my doctor strolls in talking about turkeys and crap I couldn’t care to think about. She wanted to check me and low and behold I was at 9 with just a tiny lip left. She said something about probably not wanting drugs since I was so close and I could have punched her, of course I didn’t want drugs, I just wanted to get up. I informed them of that without mentioning the punching and I wanted to get in the tub. The nurse started the water and someone helped me up. I got to the side of my bed and had a killer contraction and I needed to push like crazy. The doctor watched my contraction and asked me if I needed to push, I hadn’t realized that I did, but as soon as she said it I was like YES. She made me get back in bed, I nearly cried. She said rather than laying down I could get on all 4s on the bed. They raised my bed to sitting, I had stripped my gown off before getting back in bed. I put my arms on the back of the bed and swung my hips as good as I could on my knees in the bed. 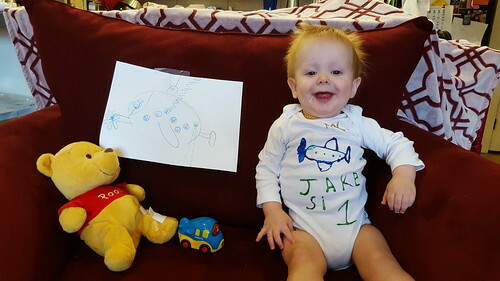 The doctor reached into my business when I had my next contraction and moved the last bit of…me that was in Jake’s way and told me to turn over. I got situated and the doctor or nurse told me what to do and off we went. After the first contraction and pushing session the doctor corrected my form and I pushed away. While I was pushing I would plead with Jake to come out and visit over and over in my head. I would take a break and do the whole thing over again. Apparently this worked because out he shot. 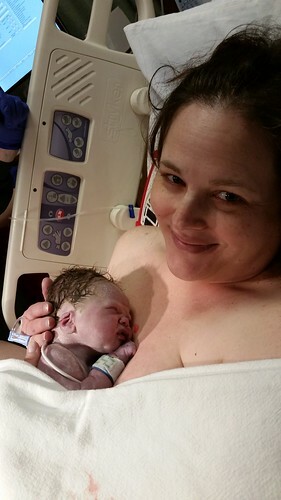 He was born at 2:29 pm, which was 19 minutes from the time the doctor said I was at 10. I looked later and found that I had my last timed contraction in the hospital parking lot at 12:29. 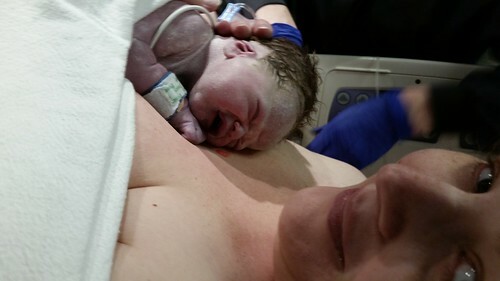 Exactly 2 hours after waddling into the hospital my beautiful boy was born. I had instructed the doctor over and over again that I wanted to wait for the cord to be cut and I wanted Jake put right onto me. Neither of these things happened because he came out so quickly he was purple and had to be put on oxygen. I have been working on this post for 7 months at this point and this part is still so hard to talk/write about. While they had Jake on little bed Mark was sure to ask over and over for Jake to be given to me as soon as he could. I was proud of him for that and so thankful too. After a few minutes they brought him over and I snuggled and Mark took pictures. Jake needed to go back under the heat lamp. I didn’t think I could walk over there so they moved my whole bed over, it was really nice. After a while they gave him back and I tried to nurse, and he did a little, but they kept wanting to put him back in the bed, have people come and check him out, messing with his little monitors. The whole thing wasn’t at all how I had pictured it going. At some point the NICU doctor came to check Jake out because they couldn’t get ahold of our doctor because Thanksgiving. 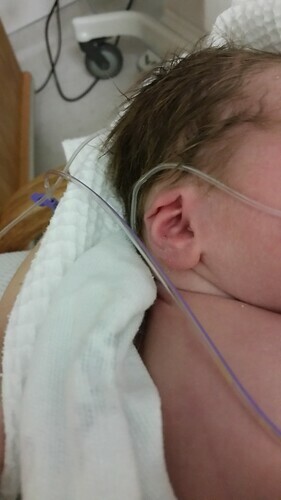 The NICU DR said that he was fine, but needed a little more oxygen. 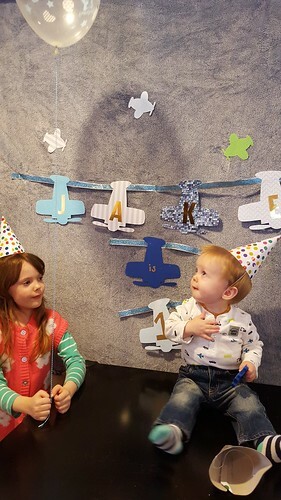 At some point a different ped came in and said that Jake needed more oxygen then they could do in a regular room so he needed to go to the NICU for a while. I had gotten to snuggle a little, but no where the amount of time I would have wanted (you know like forever). 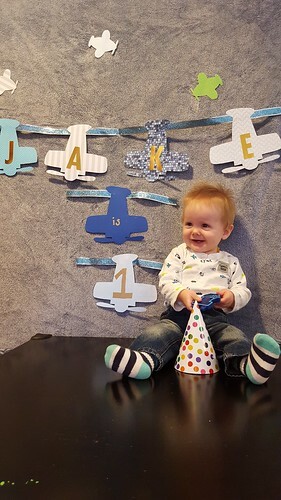 Now it’s been 15 months since Jake was born and I still haven’t finished this little story because it’s so hard to write and well life gets in the way. So after they decided that Jake had to go to the NICU they bundled him up and handed him to Mark. I gave Jake a kiss and took the first picture* of Mark holding Jake and then they left. All I wanted to do at that point was run after them, but I had to get cleaned up. The nurse helped me to the restroom and asked if I wanted to take a bath or shower. I didn’t. I just wanted to get dressed and go. And that’s exactly what I did. She helped me get dressed and then we gathered up all of my stuff and she pointed me in the direction of the NICU and she took my stuff to my recovery room. 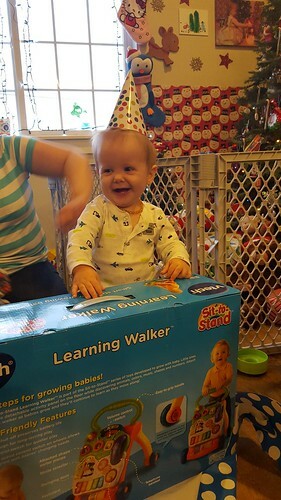 I was so surprised that I could walk and it wasn’t that bad at all. I suppose it could have been that my mind was only on getting to Mark and Jake and who cares how I feel right then, but who knows. A few days later Mark told me that he was just as surprised that I walked in on my own so soon after then got there. It was so different from Lil’s birth. This is the beginning of our 13 day stay in the NICU. That’s a whole different story. He had a flat ear just like Lil, but his rounded out much faster. 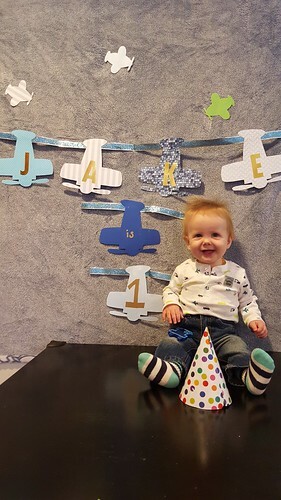 Okay so Jake turned 1 in November and I’m just now writing about it, so what? He’s still 1. And he’s wonderful. 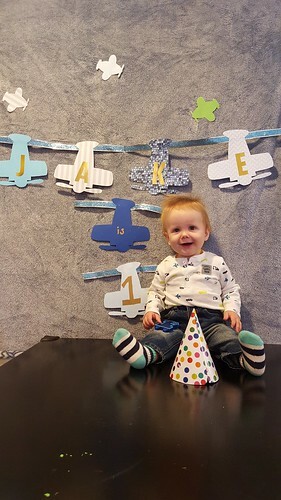 I had wanted to do an airplane theme for his baby shower, but that didn’t work out so I did it for his first birthday. It turned out great and I’m so glad that it was for his birthday and not the shower. I made all the decorations except for some dangly whirly 1s. I spend a crap ton of nights cutting out airplanes and clouds. I strung some up so they dangled. Some I just slapped on walls. All of them were made with love. 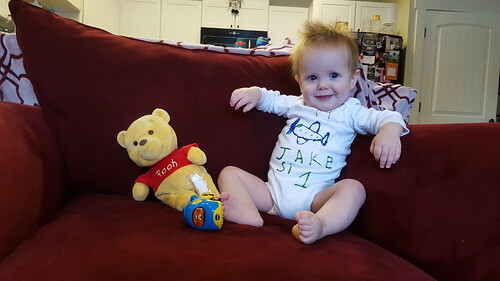 Lily made Jake a special birthday onesie and a sign. Oh of course I made all the food too and that was awesome. I made him an angle food cake with whipped cream. I also made meringue cookies that I pipped to look sort of like clouds. I tried to keep to the airplane and cloud theme. I also made some rice crispy treats, because yum. 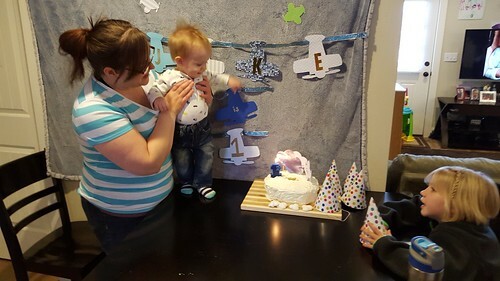 It was funny when I trued to give him some cake. 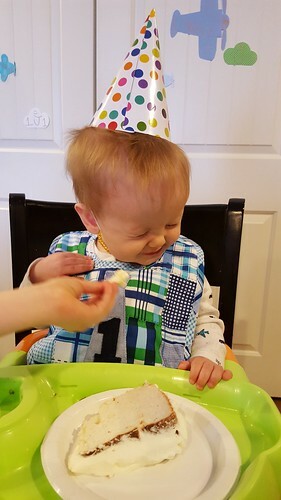 He really doesn’t like foods that aren’t pureed except his Mum Mums so when I put the cake on his tray he ignored it. I took a piece and offered it to him and he did what he always does when he’s not interested in something. He squinched his eyes closed and turned his head to the side. Silly boy. 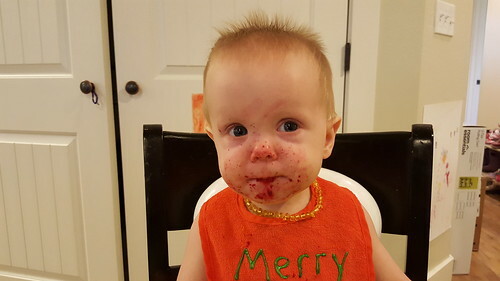 He did eat a tiny bite or two of ice cream, but not much. This boy of mine is such a joy, so sweet and just too cute for his own good. 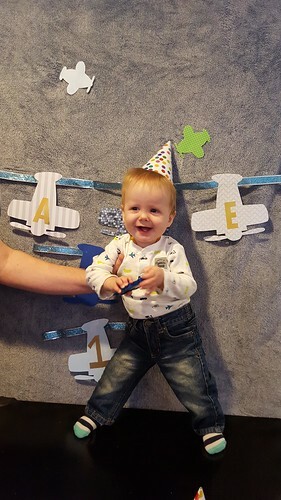 He turned 10 months last Sunday. He’s can crawl on his knees, but prefers to army crawl. When he pulls himself up to his knees and crawl Waldo says he looks like a robot. 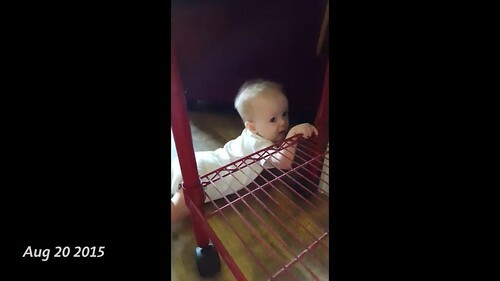 Jake can pull himself up on just about any surface and do it quickly. He cruises around the furniture, he will occasionally sign the correct sign for nurse, but most of the time he does this arm shake that means a cross between nurse and Mom. I say that he’s signed more a few times and eat a number of times, Waldo thinks I’m being really hopeful. And even more hopeful when I swear Jake says Love you after he kisses me, which he does all the time and it’s the best thing ever. I’m sure I’m missing a bunch of things he can do, but those are the most often so they stick in my head. 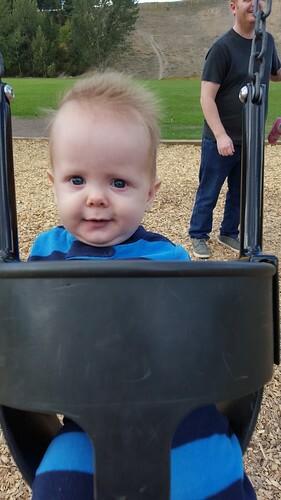 He was born with such thick dark hair and everyone said it was going to fall out and by about 3 months he still had it so we were like, bam our kids different and he’s keeping all of that beautiful hair. Que male patter baldness. Now’s it’s grown back, but it’s very light. When he’s in normal light it’s very white, but it can look very red or brown depending on the light. I can’t wait to see what it ends up. His eyes are still very blue and I love them. I really hope they stay blue, but I won’t be disappointed if he’s got hazel eyes like Lily and Mark. 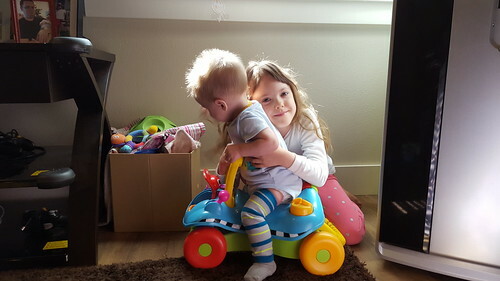 Lily is the best big sister since well me. 🙂 She’ll do anything for Jake, except call him by his name. He’s brother or Buddy, I can’t even trick her into saying his name. Silly girl. Jake adores her. It’s so sweet to see them together. For the longest time Lil was the only one who could get him to laugh. Now we all can, but she can still do it the easiest. 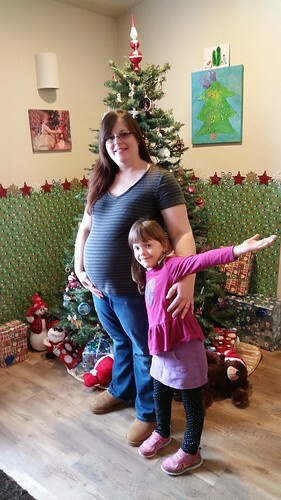 Most people will tell you when you are pregnant with your second that you need to prepare because they won’t be anything like what you already have. Well, that’s just not the case for us. 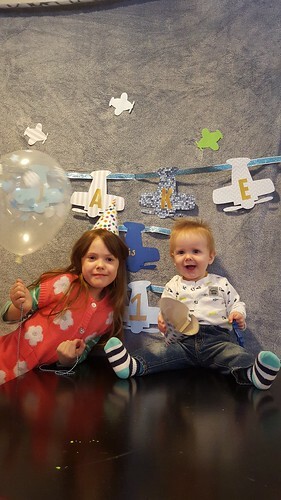 Jake is SO MUCH like Lil was when she was a baby. He’s just as shy as she was, he really doesn’t want anyone holding him except me or Mark. He wants to be held almost constantly. We went out to dinner the other day and I had to use the changing table in the restroom for the first time, he started screaming the second I put him on it, just like Lil did. He gained slowly just like she did and I’ll get to that in one second. He’s as bad of a sleeper as she was if not worse and that’s saying something. Sleep: Ah how I miss it. I’m so tired all the time. His sleep got so bad that I started tracking it on a note pad a few months ago. I now have 3 full little yellow note pads with his Up and Down times all over it. 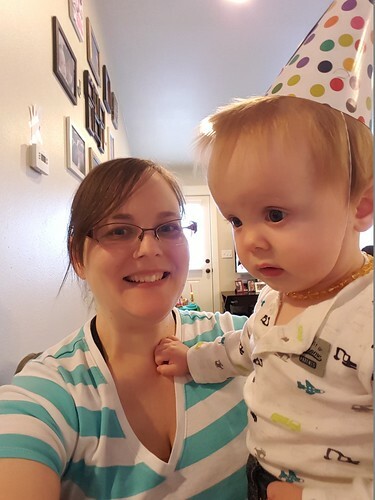 I’ve tried everything, routine, massage, sound machine, keeping him up longer after he shows he tired, putting him to bed the second he shows he’s tired, bath, some essential oils, co-sleeping and bed sharing (he has a pack and play in our room that he takes naps in),swaddling, feeding him solids right before or a few oz of formula to top him off. The only thing I don’t do is cry it out. None of it matters. I’ll put him down for a nap and then anywhere from 1 minute to an average of 25 minutes later he’ll be up. Sometimes I can get him back to sleep, sometimes that power nap is all he needed. Occasionally he will sleep for an hour, it’s very rare, but once or twice he’s slept closer to two. At night time I nurse him to sleep and put him down and that same 1 to 25, but sometimes 45 minutes later he wakes up and I nurse him down again. Repeat till we go to bed. After we are in bed I’ll bring him to our bed once he wakes up. Then depending on the night he will snuggle next to me and we will sleep with some dream feeds all night long, but most nights he will wake up and I have to either sit up on the bed with him nursing back to sleep or way more often than I’d like we have to come out to the living room because he’s too away and will wake Mark. On average once we go to the living room we reswaddle and sit on my ball chair and he nurses back to sleep and I’m back in bed in an hour, almost on the dot most nights. Occasionally it’s a little less and a few times it’s been more like two hours. Kill me. Take last night: 4-5 Lily and Mark took a walk with Jake in his new to us stroller and when they got home he was tired, but I was making soup and couldn’t stop. At around 7 he was melting down and ready for bed. Between 7:30 and 9:30 he had to be put back to sleep twice. Once we got in bed he woke pretty soon and I brought him into our bed. He was fussy, but I got him back to sleep, around 1 he was really fussy again so I sat up and got him back to sleep and down by around 1:35. At 4:20 he was wide awake. We went to the living room and were back in bed around 5:20. He was awake again at 6. It was a very long day for me. It’s such a good thing that he’s cute and normally very happy and I love him lots. This sleep thing is just like Lily, although he may be a bit worse with the getting ups. At least I have lots of practice and I know it won’t last forever.